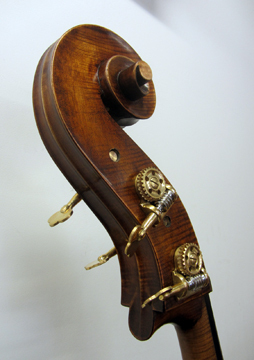 This is a grand pattern inspired by JF Lott, known the King of English Double Bass makers of the 19th century. This Bass is very impressive in its dimensions, sound and overall beauty. To make a Bass of this size with a 41" string length is in itself an accomplishment. A Bass that looks and sounds this good will not go unnoticed in any venue from a Jazz duo to a full Orchestra Bass section or anything in between. It is even fairly comfortable for solo work. Ribs; 9 1/2"-9 3/8" tapering to 7 1/4" at the neck.